For all the crap that chicken nuggets get, they're the delicious golden stars of McDonald's. The chewy meat is a perfect conduit for sauce and the crunchy exterior will almost always make you smile. And though you probably know it already (or came up with your own personal theory), all of McDonald's chicken nuggets really do look the same. 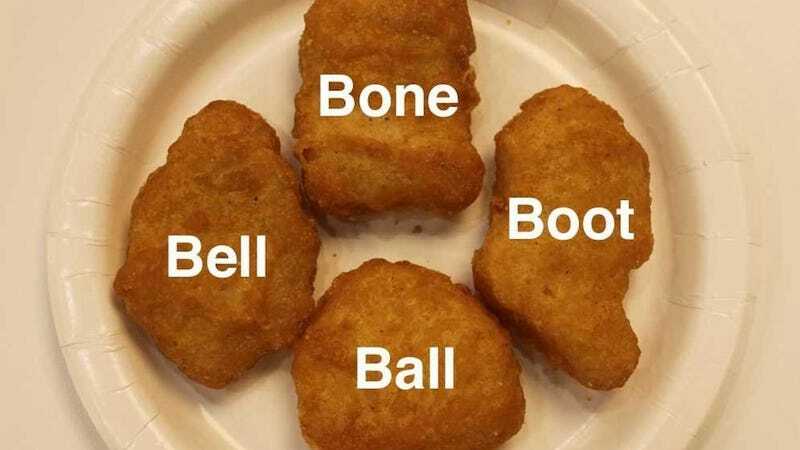 In fact, there are only four kinds of McDonald's Chicken Nuggets. The fantastic four: Ball, Bell, Bone and Boot. The image, which was taken by Business Insider, shows the ideal holy foursome of chicken nuggets: a round one, a wide one, a long one and a curved one. The push to conform the nuggets comes from McDonald's Sensory Team, who try to get each nugget to match up perfectly to one of the established four of Mount Nugmore. I think they do a pretty good job as I've definitely seen the collection in my tray many a times.